People who bought the first version of my Level 1 workbook might have been disconcerted to find a couple of rude words in the spelling lists at the back. I've now taken these out, but let me explain why they were there in the first place. My workbooks, all of which you can look through on YouTube, are intended as supervised activities. The role of the supervising adult is to say each word to be completed/written, say the sounds for the spellings at the top of the page as required, plus provide feedback and immediate error correction, and reminders to the learner(s) to say every sound as they write its spelling. However I recognise that parents and teachers can't supervise learners every minute of the day, and that a younger learner might turn to the back of their workbook while you're not looking, and find a word you'd probably rather they didn't. The spelling lists were included not for learners but as resource lists for parents and teachers, so that they could easily check whether a pattern had been consolidated and create extension activities with words containing the patterns under study, such as crosswords (click here for an example DIY crossword website). I reasoned that parents and teachers would only be using words that were appropriate for their learners from the spelling lists, and that if I tried to only include words that were suitable for every possible learner, I'd end up with pretty short lists. When I studied Applied Linguistics, it was drilled into us that linguistics describes language, it doesn't prescribe a certain type of language. Likewise in Speech Pathology we were taught that our job was to help clients communicate what they want to communicate, and not deliberately or inadvertently restrict their content. For example, when programming communication devices, Speech Pathologists need to be aware that non-speaking adults often want to be able to use the occasional swear word for dramatic or comic effect, as speaking adults do. Whatever you think of swear words, the fact remains that they are very common, and as soon as learners can read them, they'll see them written on walls, toilet doors, etc all over the place. Large companies, like the one with the big "FCUK" logo, also sometimes refer to swear words in their advertising. Swear words are also in dictionaries found in schools, and in many books for adolescents, including ones set as required reading. Kids know that swear words exist, so I originally decided that I wouldn't censor my wordlists, I'd leave that up to parents and teachers. When you work with older, tough kids, you realise that swear words can be among the highest-frequency words in their spoken vocabulary. Some kids can barely talk about their sandwiches without adding an adjective starting with "f". Rude words often come up during word-building activities with such learners, and my tendency has been to say, matter-of-factly, "yes, that's a word, this is how we spell it", and then move on. Getting too puffed up about rude words only draws more attention to them, and makes it more likely that they'll be used to get a reaction. This weekend there was another story in one of the major Melbourne newspapers about the newish school which has been established in my local juvenile justice centre, where the aim is to give kids who have gone off the rails a good education and thus help them avoid further entanglements with the law. It's in absolutely everyone's interests that these learners engage with literacy and learn to read and spell well. If including rude words on their spelling lists can help engage their interest, and convince them that the work provided is not just for little kids, then I think it's fair enough to use them. Reading and spelling aren't just polite and pretty, they let you find out about and express all kinds of things. If you've visited ancient sites in Egypt and had your tour guide point out some of the ancient, slightly pornographic hieroglyphic graffiti, or if you've talked to an experienced City Councillor about graffiti, you'll know that graffiti is impossible to stamp out. If anyone standing for election to your local Council promises to stamp out graffiti, he or she is either an idiot or hasn't done his or her homework, so don't vote for him/her. As fast as you clean graffiti off one wall, it appears somewhere else. Anyway, I really like some graffiti, such as that found in Hosier Lane in Melbourne's CBD. For those of you who don't know it, Hosier Lane is completely covered with the most glorious riot of ever-changing graffiti. It attracts swarms of tourists with cameras, plus lots of wedding parties wanting a non-traditional photo location. 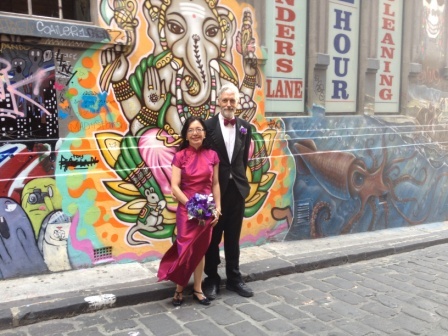 This photo is of my friends Katherine and Nik, who have the grooviest address in Melbourne, right near Hosier Lane. When they got married last year, all they had to do was walk round the corner for some photos. On the other hand, look-at-me, scrawl-on-a-wall type graffiti annoys most of us. However, if there's one thing that annoys me even more, it's look-at-me, scrawl-on-a-wall, misspelt graffiti. So if learners must needs write rude words on walls or elsewhere, let's at least help them get the spellings right. This entry was posted in books, phonics activities, sound-letter links, spellings, teaching strategies on March 25, 2013 by alison.